This falls into the category of "Oh, I thought you were joking." A dear friend asked for a Meryl Streep quilt and then a few weeks later, emailed me a bunch of images of her, over the ages, for inspiration. I kindly considered the images, selected my favorite, and tabled it for a decade down the road when I felt at all prepared to tackle that. About one year went by and Meryl was still a glimmer in the eye. I attend QuiltCon in Savannah, and there is this pop art quilt of Abraham Lincoln. I realized that doing a literal interpretation of her was always bound to fail, but that pop art might be my out. I got all excited and started pulling beige and grey and blacks and purples for this quilt. My husband stopped me: "You wanted to do a pop art quilt, not copy someone's version of Meryl Streep from the internet. You need to change to colors to pop art." Me: "Yeah, I don't know how to do that." He helped me learn! Then Meryl became this, which I gridded off in 4x4 squares. It got worse before it got better though: I started by using regular piecing for each square. It turned out literally look like Frankenstein, so again the project stalled. I started looking into raw edge applique and the possibilities and limitations, and risks of that method. Just gluing down tiny pieces of fabric? Would it work? This is supposed to be the top right corner, part of her head and hair. YIKES. The raw edge applique was liberating and terrifying. I used NO interfacing, just a gluestick and some scissors. I got to use colors I almost never use, like pink and purple, and even now I know she's quite delicate. Would I make another one? Hard to say. This was a LOT of hours, after a LOT of trial and error, and it's a decorative quilt only. But, I'm proud of myself for facing the challenge and turning out a product. Also, that moment when she started to actually look like Meryl Streep was kind of great. Sometime this fall I discovered Nancy Purvis, of Owensolivia, because I kept seeing references to her book, accompanied by these fantastic quilts. Quilts that inspired me, many that were wholly fresh, and the interpretations I was seeing on Instagram by other quilters were often even more compelling. The patterns are from her 2015 book Quilting From Every Angle, and the pattern for this, the Concordia Quilt, is included in the book. Let me be clear, I would like to make at least four quilts from this book, which is saying something in the oversaturated market of quilt books these days; but this one was first on my list, and the true "must-do." First, I had never paper-pieced more than a block or two for fun and to learn, and I try to make each of my quilts intentional and skills-based now, each one presenting a tougher challenge or new approach or skill, so this one appealed to me. But also, the greyscale and those long, low geese really got me, and the crisp, satisfying lines happening everywhere. I picked up the Graphite yarn dyed linen on our recent vacation in Portland, at Cool Cottons, because I was swooning over their entire collection of the Essex yarn dyed linens (I am late to the party, but I am obsessed with the texture these fabrics bring to my quilts). I didn't realize until I came home and starting stitching up geese that this color is unavailable in all my regular fabric shops, including online. So I ordered more directly from Cool Cottons; hurray for excellent local quilt shops with fast shipping across the country! The Onyx is beautifully hand-dyed in Brainerd, MN (the town where the film Fargo takes place, where Marge Gunderson lives), giving it the softness that most black fabric lacks. I purchased this particular yardage last year this month at QuiltCon 2015 in Austin, so that's special too. The recipients are our wonderful friends, who recently became parents; Darcy and I have been in a monthly book club together with a couple other girls for three years now, which we started during the three months I worked at the same company as her. Darcy is a graphic designer by trade, so I had to make sure it was something she could like and appreciate, based on her aesthetic. I only got more excited about this design and my decisions the farther along it came. I modified the pattern in some places, removing a double-cross of line on top and bottom, because I wanted the flightpath lines to be simplified and stand on their own, and also honestly, because those pieces looked too small for the gain I saw them bringing to the overall quilt. I do not regret the choice. I therefore modified the lengths and heights of the tiny stripes you see, and also went with a few less geese in the groups for a bit of irregularity, like exists often in a pack of birds. My favorite part of this design is the negative space between each touching wingspan, thought those tiny, steely stripes are a close contender. Really, I love the moment overall and am very jealous that this now belongs to sweet little Colin (who acted a most behaved model in these pictures, in his little coordinating onsie). As an aside, today, February 7, was Colin's due date. He came about ten days early, but this quilt's due date remained the 7th, and it arrived right on time. A due-day gift, shall we say? IN early 2015, I was approached by a friend who was interested in commissioning me to make a quilt for his bed. Casey's quilt came from the Long Island Modern Sampler, which was in the QuiltCon quilt show in Austin, TX and was one of my favorites from the entire show. It was made by Kim of Leland Avenue Studios. After a lot of discussion, we decided on this as a basis for the quilt I would make him. Kim's original was a sampler based on a trip through some of the quilting blogs online, so it was a wonderful inspiration to have chosen, as many resources were online already. I sourced the remaining two-thirds or so of blocks through some other patterns, blogs, and quilt block books. My version had to be expanded considerably from our inspiration, as it needed to fit on a queen size bed, which meant pulling even more block ideas into the process. From the grid below, a few of my favorites are the modern chevron (#28) and the pineapple block (#26) as well as the improv nine patch (#39) and the very tiny log cabin (#36). There's also something wonderful about the bachelor's puzzle and the arrowhead puzzle (#s 20 and 40). I made an entire baby quilt based on the Modern Sliced Scrappy block (#25) for my sister-in-law, that block was so satisfying. I've listed those resources here, along with the names of the blocks. This sampler, just like the (much simpler) one I'd done in 2012, was a wonderful ride through some quilt skill-building. I continued to challenge myself and try new color combinations, block techniques, and arrangements. The non-standard alignment of all the blocks presented a challenge too, as well as the general size of a queen-size bed quilt; as anyone who's ever made a quilt can attest, the larger it gets, the harder it is to maneuver at every step. For that reason, I also used this quilt as a valid reason to finally take a long-arm certification course and tackle the thing on the long-arm. It's about 90"x90" when we stopped adding width and height. The gold and blue square, detailed here, was by far the most work of any of the blocks (I've been asked this a lot, so there you go). SO MANY SEAMS on the Wheel of Fortune block! On the official exchange day, the quilt I spent April to September making is finally in the hands of the owner and commissioner, my friend Casey! He has a wonderfully eclectic and diverse collection of existing art throughout his Atlanta apartment already, and I knew this would be a lovely addition to that collection. I am so thankful for Casey and his appreciation and value of my art and my time, as his support allowed me to take on this huge, mental and creative challenge. Interpretation of African strip quilts, based on one I was obsessed with in Material Culture class. Small throw size. Completed 2012. This quilt was my first real stumper in the evolution of my early quilting days. I bought all the fabrics in a fit of inspiration in the adrenaline that came after a job interview, still in my interview clothes. The job would be a huge upgrade within the organization where I was already working, but in a position that was the most miserable I'd ever had in my life. I was coming off a summer where I felt truly depressed, and a minor, embarrassing workplace injury, in which I also split my pants as I fell. This would be a major upgrade. Like, to air conditioning instead of warehouse. I was standing in A Scarlet Thread picking out all these fabrics, not really intending to do much with them, when I got a call and was offered the job, not ninety minutes later. So naturally I bought everything in my arms, including a mostly pointless flying geese ruler that I've used exactly thrice. Then, I sat on it forever. When I finally did cut it up one day, seeking to recreate my favorite quilt image (below) from the African strip quilts featured in The Afro-American Tradition in Decorative Arts, it was small, so I added a border and hated it, so I added another border and hated it more. Finally I trimmed the stitches all the way around, removing both borders in one fell swoop and adding the strip of red and cream down the righthand side, finally settling with a small but gorgeous version of what I intended. I love when stripes do extra work by looking like I did all this extra stitching but it's just part of the fabric. I stored this quilt top for nearly a year then, until a long weekend when I was unemployed and Ben was at DragonCon, and I pulled it out and pieced a back (that I might love just as much as the front, really) and did the straight-down-the-seams quilting you see here. I love the texture. I mentioned above, this was inspired by an awesome image in one of the books we used in a Material Culture class in my graduate school program. I named the quilt Upper Volta after the regional cultural origins of the strip quilt that inspired it. The term comes from the traditional woven fabric made in West Africa in long, narrow strips, then used in many ways, including pieced together for the utility of warmth -- my favorite thing about quilts. Pattern from Quilting Happiness book, two-color, red and white quilt, machine pieced, hand quilted, 2013-2015. I've made a red-and-white quilt before, my Denyse Schmidt Single Girl, and it appears I loved it so much (or had so much Kona Chinese Red leftover) I made another. The problem, once I'd made about half the blocks for this large lap-size and fallen in love with the on-point direction of the blocks, was that I ran out of Chinese Red and every single cut I ordered or bought anywhere was slightly off my original cut. This is troublesome in any work with solids, but reds are especially notorious in any context, and are so easily just a bit off. I'm quite pleased that in these photos, that difference is barely detectable, but you can definitely see it in person. However, I decided at a certain point, I did not care, and in fact to embrace the slightly-varied reds might be my new point. I came to see it as the distinction in this quilt compared to any other of this pattern. Since after all, I did make this using the same fabric scheme as the book the pattern came from, Quilting Happiness. I finished the quilt top right around the time I was fully smitten with kantha stitching and pearl cotton for my hand quilting, and went with a double-grid hand quilting stitch along all the block lines. I. Love. It. It sat in-progress on our couch for at least a year while I hand-quilted in good TV time. I went ahead and finished the binding before the quilting, even, so that it wouldn't leak threads and batting all over the sofa while it remained in-progress. (Genius, I know.) Technically, I still need to go inside each white cross and add a little X or a square in hand stitching too, but you know, that's for someday. This post is being published several years after beginning this project. I'm liking the slow, intentional process, the weeks and months and sometimes years that go into the quilting making art. This quilt was designed as a lap quilt for Ben, my husband, and I finished it over the Christmas holidays in 2011. It remains one of my most favorite pieces for the solid white-on-white quilting lines, which give the simple negative space so much texture. It looks great on the chair in his office even when not in use. It was based of an image of a Denyse Schmidt improvised single log cabin block set against white. I finished this quilt with my left foot on the machine pedal, as I had just had surgery on my right foot that December. I was also doing a lot of driving with my left foot - slightly dangerous yes, but I was getting a lot of practice driving the sewing machine. 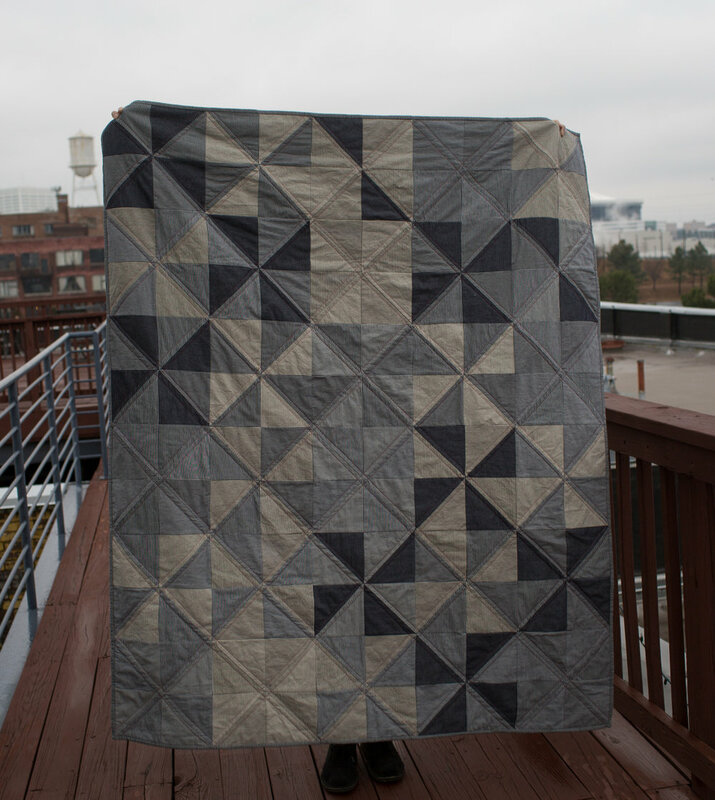 I saw this quilt, almost exactly as you see it here, on Purl Soho's site and asked for the kit to make it for Christmas. I have never purchased a kit before, but I adored every fabric in the Robert Kaufman Denim Railroad line, and the touch of them in person does not disappoint. Some of them of stiff, others quite soft, and together, they make distinct motion. The computer even has a hard time translating all the activity going on between these pinwheels all lined up. I finished the quilt top in the wintriest months of 2013-2014, culminating in the quilting and binding, which I did over the week of "Snowpocolypse" in Atlanta--when officials called off work and school days just late enough that we were already at work, snow fell and no one had salted the roads yet, and then hundreds of thousands of us all headed for home at the same time. It look me almost ten hours to get the twenty-odd miles back home. The rest of the week, I stayed home and read, backed, went on snowy walks through the city streets, and finished this sofa quilt. It works so well in our living room. The primary change I made from the kit was that I used red thread to quilt the straight lines, creating a nice contrast. You can see it in the crosshatch detail on the back, below. Design original, inspired by a photograph of a vintage quilt, my entry in the Michael Miller fabric challenge for the Modern Quilt Guild, 2014. Welcome gift for my first niece, Adrian. This quilt was so, so many tiny half-square triangles. Since it was a fabric challenge, we got the printed fabrics free, so long as we used them in the projects we made. It also means I ran out of fabric to make more HSTs, so the size of this baby quilt was determined by when I ran out of fabric. It also affected the design, as you can see, where the streaks end. When I also ran out of the Coral color (I did buy more of that beautiful solid, a perfect orangey-pink), I played with the basic premise of a quilt as having four corners and four sides. Why not five sides? I spent some time with free motion quilting on this one, branching out from my favorite and usual straight-line quilting. My mom and I worked on it over Fourth of July weekend 2014, and in a very quick and terrifying moment, with everything moving so fast, that I impaled my finger, broke the needle off inside my finger, thread and all. Quilter's rite of passage, right? Thankfully my mom was there, because I was in panic, and she grabbed some pliers and pulled the needle out from the soft side before we took a full look at the giant hole and crack going through the fingernail side. Scary! For a few days it hurt and all I could think was that tiny pieces of needle were floating in there, but it was all in my head. I came home from QuiltCon 2013 with a pattern for this chainlink design that charmed me in one of the booths in the expo hall. I rarely am so persuaded, and I had just the project in mind: my friend who was having a baby in September that year, best friend from college who happens to be a math teacher now. I knew I needed to use that sweet Carolyn Friedlander mathy fabric. You can see it's a reverse interpretation of the one I saw, where the pattern is happening behind the links. This quilt wound up being a very small stroller quilt of sorts, as I honestly ran out of the solids I had, and had no idea what colors or brands they were to be able to buy more. In keeping with the tone, I used those pixel blocks for binding. Did I mention she and her husband are both math teachers? Their children's names can both be spelled out using mathematical symbols and characters. Toby's baby quilt - used pattern from QuiltCon 2013. In 2013 I was making quite a few gift quilts, as quite a few people close to me were achieving milestones - marriages and births. I needed to make a wedding quilt for my dear grad school friend and fellow news and history nerd, and wanted to make something scrappy and fun as well, and had just been smitten by an easy and graphic idea on Fancy Tiger Crafts for big triangles. I made mine smaller than the original idea, and the final goal was a throw size quilt. I never presume to make larger quilts for people's beds - that's quite personal. But a quilt for Sunday afternoon Netflix marathon or nap? Absolutely. 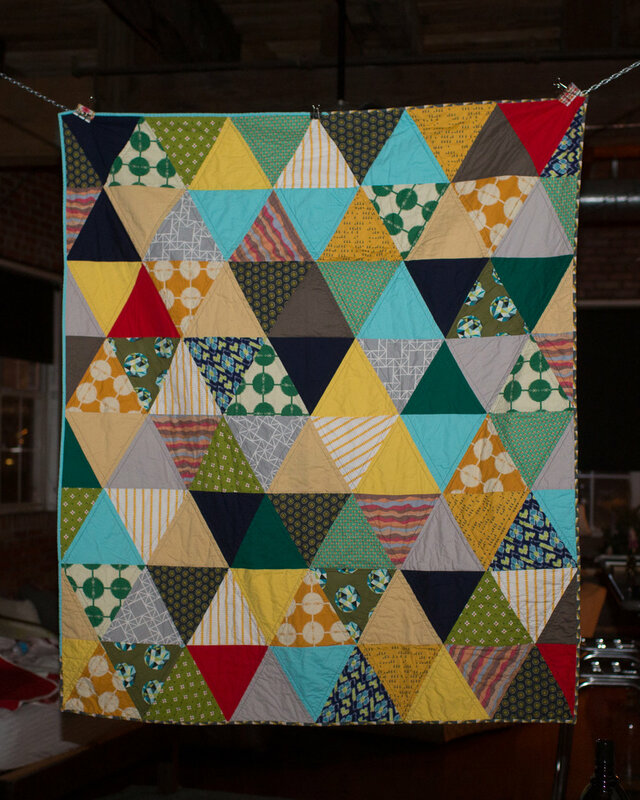 Katie and Seth's triangle scrappy quilt came of this. I pieced the entire top in a single weekend, blowing off steam and funneling my anger at not getting a particular job I really wanted but was told I was "overqualified" for. It was good timing. I have since loved its cameo appearances on Katie's Instagram photos, usually nearby one of her rambunctious cats, Bruce Wayne and George Harrison. This was a very early quilt, made in 2010 using fabrics that were rich and reminded me of stacks of Indian saris. The patchwork was simple, contrasting the complicated work I had just completed on Ben's quilt, Grid, featured elsewhere on this blog. It was my first stab at free motion quilting ever, and I did it without dropping the feed dogs, meaning it was a rollicking time fighting with my machine until I decided to ditch the presser foot too - then it was practically anarchy. So, don't look too closely at the free motion quilting here. Just use it in my backyard when you're over for a picnic. These images of textile production factories make me incredibly happy. Something to do with the scale, the other-worldliness, the strange assault of color against the everyday dull of the factories where textiles are produced. Images from "The Weird Tech and Brilliant Colors of the American Textile Mill" in Wired, Feb. 2015. Anyone who's lived in this region recognizes the shape of the state, it's unmistakable, one of those distinctive combinations of land and water you can always identify. It's the kind of iconic geographic image you'd surely know from space. So I wanted to put this image on fabric, make it from fabric. But my only ideas involved variations of appliqué, since the outline is fairly intricate. I didn't really know how I was going to effectively portray the map in fabric. The second thing was the impending marriage of my childhood friend Lauren and her now-husband Dave. Both were raised in Michigan and their families still live there. She and I went to Young Fives (kindergarten) and Kindergarten together in Negaunee, and Dave is from Lower Michigan. They now live in Athens, Georgia, funnily enough, just an hour and a half away from me, where they're in a nueroscience PhD program. I knew that this was my opportunity to make a Michigan quilt that I could actually share. I have far too many around my house already, so I always look for the kind of home that can benefit from a cozy quilt. Being far away now from their homeland, I knew if there was anyone who would appreciate the outline of my native state, it would be these two. I didn't get it to them before the wedding, but sent it so that it was there right when they returned from their honeymoon. So this pixelated image is what I used to convert the geography of the state and its Great Lakes outline into a patchwork of gradient fabrics swatches. 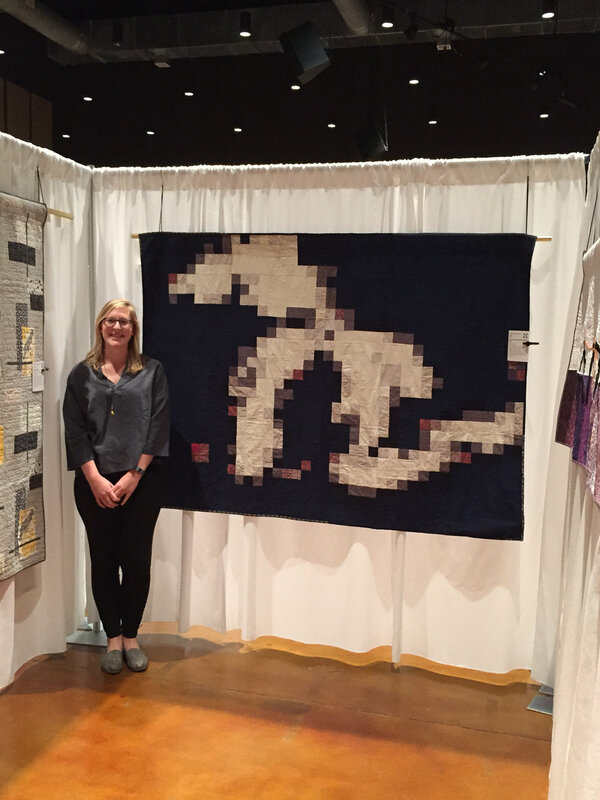 I happened to mention that I wanted to make a Michigan quilt to one of my friends at the West Atlanta Modern Quilt Guild, and she mentioned pixel quilts. Had I ever thought of doing it that way? I hadn't. But there's an online tutorial, she said, for turning a picture into a pixel quilt. 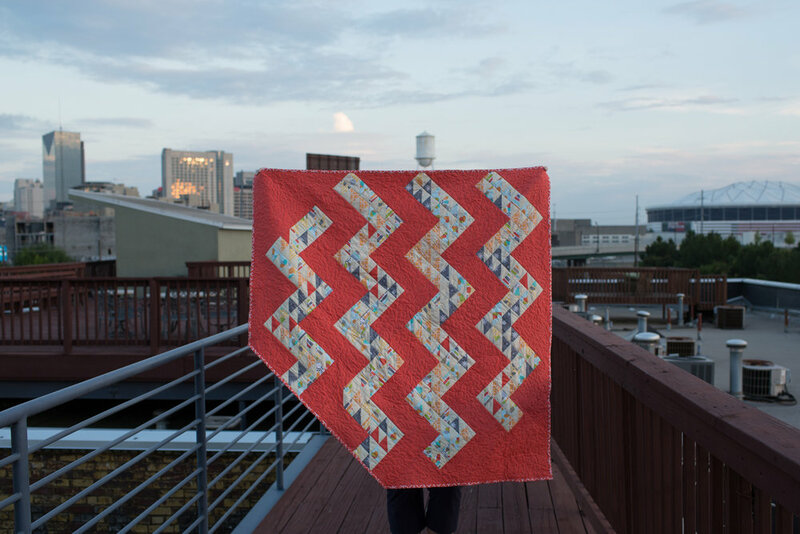 It's Caro Sheridan's From Picture To Pixel Quilt, and it's free on Craftsy. I highly recommend it. This concept seemed entirely intimidating to me until I walked through the steps and videos she's laid out. Creating the image above is the first step. The next one is below. It involves a lot of formulas in a Google Docs spreadsheet, and then breaking it down more and more. It helped seeing her go through it step by step to understand how few colors I really needed, and to perfect just how pixels I could include to maintain the shape without going insane. There are some really crazy quilts on the internet (just Google image search "pixel quilts") that must have taken thousands of hours, portraits and very intricate renditions of photographs. The point was not to want to commit suicide, but to make a modern quilt that interpreted Michigan in a fresh way. So I kept that as my goal. Section by section, I put it together. It came down to one shade of blue, two shades of grey, a dark almost-black (Kona Pepper), and a beautiful, rich cream for the lakes. I know technically the blue would be water and the white doesn't make sense, but I just loved the blue-and-white image more than traditional maps that I tried out in pixelation. Stacks on stacks on stacks of squares and rectangles. Before long, actually, they were all there, methodically pieced and labeled each time I finished one. They're really just 8 Patch squares, sometimes 16 Patches. Masking tape was crucial in ensuring I had them oriented correctly and in the right order left-to-right and top-to-bottom. I threw in the mauve shades when I noticed the bits of purple and pink that popped out of the original pixelated image. I want to encourage you, if this seems overwhelming, to go through Caro's tutorial. And don't let the math intimidate you. I took this as a chance to learn some new skills, design my own quilt pattern, and work through all the cutting and planning and required fabric on my own. I've done this before for improvisational quilts, but by the very nature of an improv quilt, that rules don't matter all that much, and measurements are only guidelines. This was a wholly rewarding process and learning experience. This was when it all started coming together. Below, I was playing around with the order of the strips, once they were coming together, to see if I could make it incomprehensible. I'm pretty sure this looks like a whole bunch of pixeled nothing. And there it is almost ready to be a whole quilt top, in correct order. Lakes Superior, Michigan, Huron, Erie, and Ontario, all present. For the quilting lines, I decided to do straight line quilting, which I always gravitate to, but in a kind of echo pattern around the lakes, within just the blue. In the creamy lakes, I did a stitch-in-the-ditch outline all the way around, almost clockwise, if that makes sense. They're all connected, so I didn't have to stop the stitch lines anywhere, I just powered through, top-right corner of Ontario back around to the bottom-right corner. Eastern-most to eastern-most, technically. The backing actually took a lot long to decide than any of the front fabrics. I don't like to do very much piecing for the backs, and by this point, I was all out of patchwork energy anyway. But it's always a struggle to find the right scale of a print. I did want a print, something reminiscent of a forest, the woods, trees, rustic nature, a lakeside vista, a cold winter morning. My mom, living over in Italy, got about a dozen emails from me with links to certain fabrics on Fabric.com, none of which had quit the right aesthetic to match the front of this quilt. Too cutesy, too small a scale, too bright, too blue, too green, to traditional. I was getting pretty concerned. And then, through some magic of clicking and searching across the site, my favorite online fabric shop delivered exactly the right thing. Nature's Etching Birch Bark in Rust/Bark tone. Exactly. Dead-on. I am reminded of snowy mornings, and rusty cars that've driven thousands of miles on salty roads, and the blue-greens of an evergreen forest. It is exactly the fabric to represent the elements of a tough, beautiful landscape in a remote region of the country. Once I found the right thing, it was a no-brainer. I was reminded how obvious and easy a choice it is once you've found just the right thing. All those other options I felt lukewarm about were clear warnings of the wrong thing. I was on the fence because it turned out I was in the wrong neighborhood anyway. Appropriately, I named it HOME. Home for all three of us, in one or another or a hundred ways. I ran a stripe of blue along the back edge because, of course, I underestimated the square inches I would need for the back, as I often do. Imperfections give quilts their handmade character. I'm OK with it. For binding, I did something I've never done before: I used a variety of prints in my long strip of straight-grain binding tape. This was my chance to use a few fabrics that went with the motif, but would not have worked in the quilt top. It was risky after all this to put patterns on the edge, but I always love when other quilters do bold things with their binding, and so I pushed my own boundaries. I'd already done this insane self-invented pattern, worked out all the fabric cuts and arrangement and gradation, and expanded my skills with all that. I might as well also make myself uncomfortable with a bright binding. I love how it turned out. It's been almost six months since QuiltCon. Reflecting back on some images and inspiration I found there, the same old familiar things are popping up: I am now and always have been drawn to menswear prints and patterns. The muddy browns and suit-wear greys and hunter, army, grassy greens. Plaid, stripes, and checks. Browns on top of blacks. Speckles of cream. The color inspiration is endless -- it's a challenge in finding the perfect combination between drab and daring. It's about making the seemingly boring man's color palette fresh and evocative. What I love most about menswear-inspired quilts is that we are drawing so much direction from these "boring," everyday elements of life and style. But we can use them to say so much. 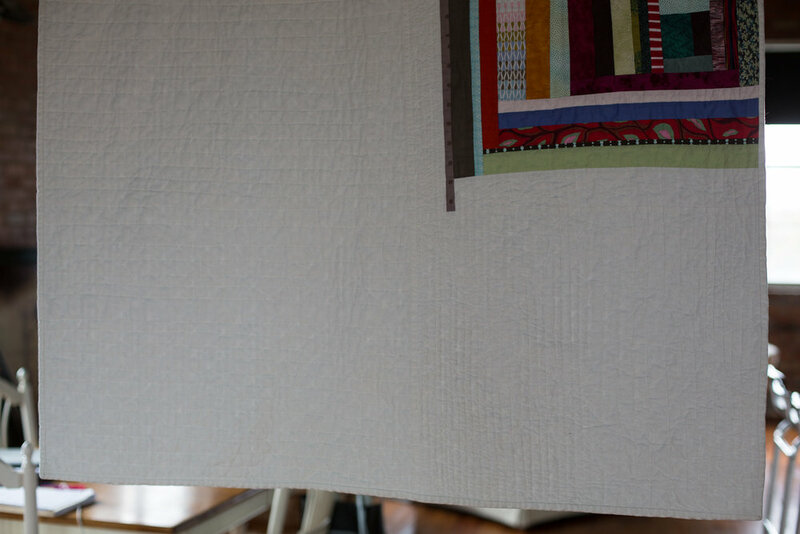 To make this quilt, the artist hand-dyed strips of this striped fabric, so that it took on additional shading and depth, and then put all the strips together to create the larger movement. The red is exactly the protest we need to break up the stripes. Do you see that tiny patch in the upper-middle where the stripes run diagonally? Utter brilliance. Not to mention some shots of red stitching every so often. I was obsessed with the coloration and distress of that striped fabric. I kept coming back to this quilt. This quilt, "Log Cabin Improv" (below) goes brilliantly beyond my comfort zone. I have been working on my own menswear-inspired quilt, it's been on the back-burner for years now, and I always end up hating it. Honestly, if I was making this quilt, with its garish orange and hot pink, I would probably have hated it. It would feel uncomfortable, and I would work knowing the risk, knowing it might come out looking absolutely putrid. Or ridiculously BOLD. This quilter has blown right past comfortable, and miles past "safe" with her wonky squares and unnatural color combinations. Plus, that plaid. This quilt reminds me that it's okay to test the boundaries of color and line. When you're up close you can see the lines and lines of red hand-quilting. And then, of course, you have the modern master of austere quilt design: Denyse Schmidt. Many of my favorite quilts of hers scream "menswear." They are simple, bold, and maintain drab color schemes, but with token quirks, little pieces of frivolity if you take the time to find them. One of the best things about seeing a whole bunch of her quilts in person was seeing the non-traditional fabrics she used, bits of mismatched motif here and there, hard canvas mixed with an actual polyester dress shirt scrap. She does it so well, it's become cliché. It's been copied, it's inspired a whole movement. It's nothing new. But experiencing these austere quilts in person felt entirely different from seeing them on Denyse's website, or in books, or on Pinterest. It was experiencing another dimension of their beauty, which is, in fact, literally what was going on. The colors look different, so that even my own photos here do none of it justice. The textures of the fabrics play off each other in unexpected ways. These quilts in real life are far more worn, faded, rustic, used than they are in professional photos. Much of that is because the quilts featured in the exhibits either came from her own personal collection or the private collections of other people, out on loan for QuiltCon. And this gets to the heart Denyse Schmidt's original inspiration, that quilts are art that is used, that serves a very utilitarian purpose. It is the opposite of a potted plant or a piece of art done in oil paint, though those things also provide aesthetic pleasure. 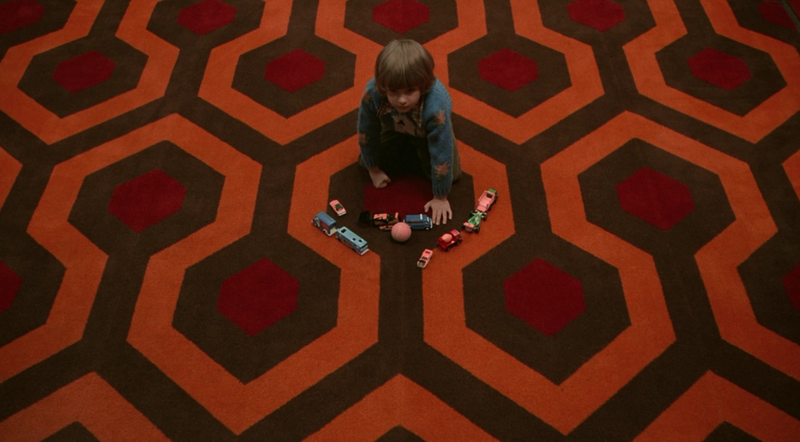 The quilts in real life had that roughness, that worn quality, and it made them even more stunning. They are not precious exhibit quilts that live inside museum walls. And that takes me back again to the whole philosophy behind modern quilting that I find so appealing: it should not be too precious. 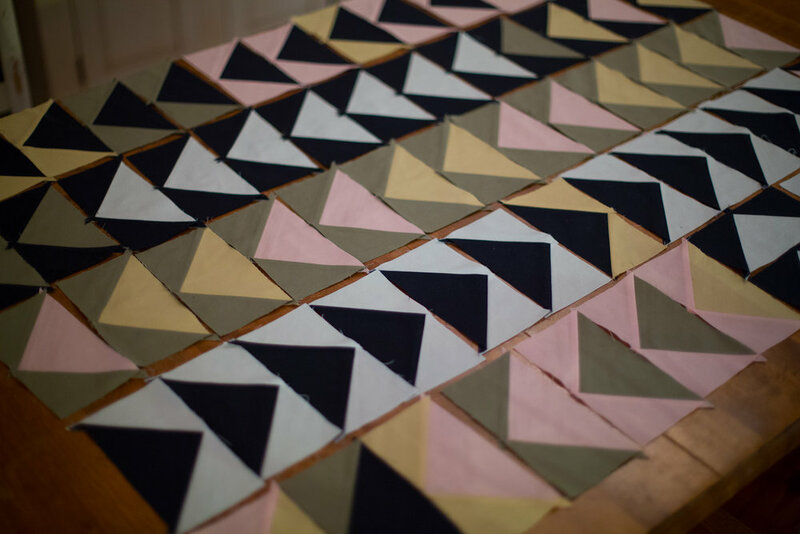 It is not about crafting a perfect object, every triangle with its tip perfect, to hang on a wall or even in a quilt show. It's about making something that is at once pleasing, lovely, artistic, and useful. It is about using elements of everyday motif, pieces of cloth we already have and love, and putting them together to form an entirely new bit of commentary on Life and Art and Comfort, and the combination of these three things. And with menswear thrown in, I would even go so far as to say we are adding to the conversation about Work, and its place in our lives. Work is there in the patterns and fabric textures. Work is there in the labor we invested in selecting, placing, cutting, stitching, basting, quilting the layers together, to make the final thing. Work is there in the memories of former workplaces, good and bad, and the dreams or dreads of new ones. It's the warehouse floor, a dull concrete. It's my grandfather's buffalo plaid and baseball cap. It is the pot of coffee in the break room and the wooden table in the conference room. It's your parents' workplace, it's your daughter's workplace. Work, which is every bit as crucial a part of the conversation of art in our lives. All that lives inside a menswear quilt, when I see it. Menswear prints were used and interpreted in many ways at QuiltCon. Each one added to this commentary, and to the breadth and meaning of the modern quilting movement. In this one, the cream-and-grey striped piece is sewn right on, frayed edge kept entirely intact. Those are the kinds of things you never see in a lifetime of online browsing. Just looking at these few images again makes me want to run home and spend the rest of the night (and tomorrow) with my fabrics, cutting, sewing, putting them together in unexpected ways, drawing from everyday sources like The Office for inspiration. Sparse stripes. Various textures. Tiny sparkles (like that little hint of a golden flower in the solid black piece in the quilt pictured just above). Retro flowers. Stripes on stripes. Herringbone. Buffalo plaid. Paisley. Houndstooth. Heaven is a menswear motif. I've been silent for awhile. It has not been because there is nothing to say. There has been far too much to say. February was the month of insane hours on resumes and prepping for interviews, and one of those jobs, I got. (So that is awesome. Obviously there is a lot to say there.) I literally got a job offer, countered, accepted, quit my data entry job and packed for QuiltCon in the span of thirty-six hours. I went to QuiltCon with all this information in my brain about the new job I would be starting in B2B software development the Monday I got back, so I was busy being totally inspired each of the days I was in Austin, and learning about my new industry in the hotel room at night for an hour, before passing out by 10 p.m. Since then my second job and my new job, plus regular life things like cooking, sleeping, relationship time, exercising, and reading have occupied any time I've had. Oh, not to mention that little side project, my first novel, that I'm working on, too. And in the whole mix, I am truly inspired to sit down at my sewing machine and work on some quilts. I just haven't had any time at all. But I finally got around to curating a collection of my favorite images, my most inspiring snapshots, from the whole weekend in Austin, Texas, for the inaugural QuiltCon, and it was so lovely to reflect again on that special time alone. It was amazing to be there alone. No one else's time mattered in the least; it was what I wanted to do, at exactly any time, for however long. Friday, I went to seven lectures, including Yoga for Quilters, where we actually got up and did some morning yoga. So I am sharing, in bits and pieces, some of the images and quilts that made the biggest impact on me. This is a series of beautiful things that struck me at my core, in a larger weekend consumed by beautiful things. What I mean is, pretty much everything was amazing to even make it there, but within that highly competitive and truly modern collection, there were some that spoke volumes. And there will be bits of my experiences too. This quilt, by Elizabeth Hartman, is simple enough, but so striking. Initially, I didn't think much of it, really. But I kept coming back to it. Something about the crisp lines where the diamonds touch the negative space is so satisfying. I was struck by taking simple strips to make stacks of color, tone on tone, but making their ultimate shape a diamond instead. I'm not a huge fan of lots of pattern in my fabrics, so I am always looking for clever ways to use some of it without overpowering the pattern and tiring the eye. This is a pleasing presentation of prints (I adore the deer wearing sunglasses in the pink polka dot fabric). I'm using it as inspiration for a wedding quilt, which I'll of course share when it comes together. This was one of those quilts I had to keep a secret while I was making it; at least, keep it a secret to the internet. I made it for the daughter of a friend, who lives far away, and though our lives intersected in the same city for only a couple years, she made an important impact on my life -- in fact one that she had no idea about at the time. We attended the same middle school for two years, and then we both moved away before high school began. Though we were in classes together during that fleeting time, we didn't "hang out" after school or anything like that. But I found her entire presence inspiring. Okay, I realize this sounds very strange. But I remember tiny details like the binders she used, and her hand-writing -- always in pencil -- and I so admired the way she was nice to everyone, never trying to be cool or put on airs to anyone else. She was confident, solitary. When I moved away and began high school with an entirely new set of peers, and began the loneliest and angriest year of my life, I sought to be like her, or at least the way I perceived her. And I think it worked, because I no longer cared to be "cool" for anyone; I was certainly always a nerd, in fact. Never one to really want to go to parties anyway. I was content driving to Macon alone to read books and magazines in Barnes & Noble on a Friday night. And I was nice to every single person in high school, perceived social pariahs included. It's why I felt so strongly to run for student body president my senior year, the inaugural year of student council at our school: because I didn't want one more friggin' popularity contest, and I felt like enough people knew and respected me that they would vote for me over the bitchy girls in my grade. And I was totally right. I loved that people who were not "popular" got so excited about my campaign, as if they could finally feel good about a student-voted position in the school's list of students who mattered. I'm just trying to give an example here, but what I really mean is that the way I am now, through pretty awful high school years, has shaped the way I am as an adult, and the confidence to remain my own person in the face of The American High School Experience can be traced directly back to one middle school classmate who inspired me with her confidence. It never seemed like she needed the approval of others to be happy, and as a confused 13-and-14-year-old, that was what I so wanted myself. That's what I embraced when I moved, and she's responsible for inspiring me. Simple as that. I've never seen her since. But we have in the last few years become friends again via social media. So I guess you can say we are back in touch, in a way. This past fall, as I've been having a pretty rough time in the job market, she took time out of her already busy life (kid number two was impending, to boot) to help me with my cover letter and resume. She went above and beyond for me, and I really value the investment of time she made to help out someone thousands of miles away when she had plenty of other things on her plate. And there's not a lot of ways I can thank her, being low on money, but I have my quilting skills. Since her daughter was to be arriving sometime around early December, a baby quilt was the natural gift. Alma Zoe arrived on November 24, and I believe the finished quilt arrived with not a week to spare beforehand. It is based on a quilt I'd pinned on Pinterest, but I made up the pattern myself, going off of that image. I love triangles in quilting anyway -- but across the entire quilt, it can be a bit busy, and has been done many times before. I was drawn to this particular use of triangles, in a hexagon pattern, across only one part of the quilt, giving your eye a rest with the simple solid on either side. And I purposely used a darker Kona Ash grey, instead of my regular creams, whites, and beiges, because it's for a baby, and babies make messes with food, split-up, poop, and any manner of matter they can get their grubster hands on. My favorite part of quilts as my art form is that, at their core, they are essential tools of warmth, and they serve a functional purpose. But they are also art. So it is important to me that anything I create also not be treated as too precious; it exists to be used. Alma's quilt came together quite quickly -- that's probably the most joyous part of making a baby quilt, the nearly-instant gratification compared to the larger beasts I usually assign myself. And every minute of thought and energy put into it was of pure love for a beautiful family, that I admire for many reasons.